Cardiovascular experts all agree that eating a healthy diet is important for reducing your risk of developing coronary artery disease (CAD). But what if you already have CAD, and perhaps have even had a myocardial infarction (heart attack), angina, or acute coronary syndrome? How important is the right diet for you? Until relatively recently, dietary recommendations for people with CAD were based more on faith than on science. This is because firm scientific evidence that a healthy diet can substantially improve cardiac outcomes in people who already have CAD was lacking. In the last few years, however, the picture has become clearer. Current dietary recommendations from the American Heart Association and the European Society of Cardiology for people with CAD emphasize eating lots of fresh fruits and vegetables and avoiding saturated fats, trans fats, and high-fat dairy products. In addition, the Europeans specify eating oily fish at least twice a week. These general dietary guidelines can perhaps be best achieved with the Mediterranean diet. There is no “official” definition of a Mediterranean diet. This is the name chosen to reflect the traditional eating habits of people who live in the Mediterranean regions. A Mediterranean diet is largely a plant-based diet that includes lots of fruits, vegetables, legumes, nuts, and whole grains, along with moderate servings of cheese, eggs, and yogurt, and with a few portions each week of fish and other seafood, and poultry. Particularly characteristic of a Mediterranean diet is the inclusion of plenty of olive oil (a major source of monounsaturated fatty acids), along with some red wine (a glass or two a day). 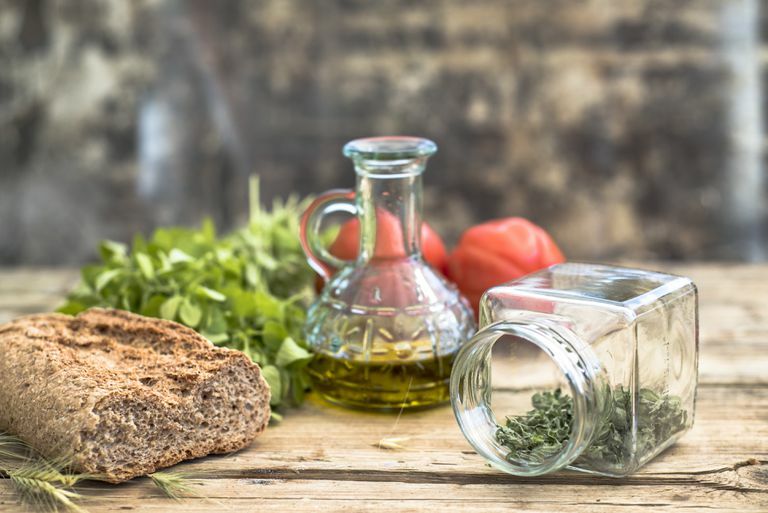 In recent years, studies have been published that bolsters evidence that the Mediterranean diet is helpful in preventing CAD—and in improving outcomes in people who already have CAD. The PREDIMED trial compared two varieties of the Mediterranean diet with a simple low-fat diet—the type of diet most typically recommended for people with CAD over the last 25 years—in more than 7,000 people who were at high risk for CAD. After a follow-up period of nearly five years, cardiovascular outcomes (that is, the incidence of heart attack, stroke or heart-related death) were significantly better in the two groups randomly assigned to the Mediterranean diets. In a second trial, more than 30,000 people 55 years of age or older who were known to have either CAD or with diabetes with cardiovascular complications were grouped according to their dietary habits and followed for an average of 56 months. Those who followed a Mediterranean-style diet had a significantly lower incidence of heart attack, heart failure, stroke or cardiovascular death. While large, prospective, randomized clinical trials with the Mediterranean diet specifically enrolling people who already have CAD are lacking, the accumulated body of evidence in favor of a Mediterranean diet appears strong. Limit red meat to once or twice a month. If you can do so without risk of abuse, consider having a glass of red wine with dinner. Estruch R, Ros E, Salas-Salvad¢ J, et al. Primary Prevention Of Cardiovascular Disease With A Mediterranean Diet. N Engl J Med 2013; 368:1279. Dehghan M, Mente A, Teo KK, et al. Relationship Between Healthy Diet And Risk Of Cardiovascular Disease Among Patients On Drug Therapies For Secondary Prevention: A Prospective Cohort Study of 31,546 High-Risk Individuals From 40 Countries. Circulation 2012; 126:2705.